Old-school gangsters and modern pop-culture fandom collide with action-packed and comical results in the new humorous crime thriller "The Don Con" by Richard Armstrong. Published by Pace Press; publication date April 2019. 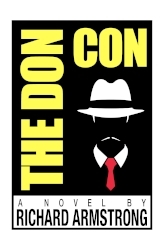 Fresno, CA, April 02, 2019 --(PR.com)-- Mystery readers who delight in crime caper action will enjoy new crime thriller "The Don Con" (Pace Press, April 2019) by Richard Armstrong. A comic crime thriller in the tradition of Carl Hiaasen and Janet Evanovich, "The Don Con" mixes suspense, razor-sharp pop culture satire and author Richard Armstrong's dry comic style into a delightful cocktail of pure entertainment. Joey Volpe hit the high watermark of his acting career when he played a small role as a mobster on "The Sopranos." If you blinked, you missed it. But now he's unemployed, broke, and forced to make a living by signing autographs at pop-culture fan conventions, or "Fan-Cons," for $35 a pop. His lack of income, along with his chronic womanizing, has put his marriage at risk, too. But Joey's already terrible life gets even worse when real mobster Tony Rosetti shows up in the autograph line with a plan to rob celebrities at the next Fan-Con. All things considered, Joey would prefer not to, but when Rosetti kidnaps Joey's dog Gizmo -- and hints he will do the same to Joey's wife and daughter -- it's clear that this is an offer Joey can't refuse. But in prison, things start looking up for Joey. He makes a new set of friends who have intriguing professional skills, especially Nigel, a smooth-talking con man so elegant he makes Cary Grant look like Chris Farley. Joey and his prison buddies devise a scheme that is audacious, nail-bitingly suspenseful, and laugh-out-loud hilarious. When Joey gets out of prison, he uses all of his acting skills on some new projects: Revenge. Money. And saving his marriage. Combining the intrigue of "Ocean's 11" and "The Bank Job" with pointed comic takes on "The Sopranos," "The Godfather," Comic-Con, "Star Trek," "The Sting" and nerd culture, "The Don Con" is a crime thriller / screwball comedy that will leave readers breathless with excitement and laughter. Richard Armstrong's previous books include "Leaving the Nest," "God Doesn't Shoot Craps," and "The Next Hurrah," which was praised by the Los Angeles Times as "captivating and complete" and by Kirkus Reviews as "One of the best books on the ramifications of the electronic political process since Joe McGinniss's 'The Selling of a President.'" A 1974 graduate of Carleton College, he works as a freelance advertising copywriter and lives with his wife Sharon in the Glover Park neighborhood of Washington, DC. 5.25" x 8" trade paperback, 280 pages. Also available in e-book formats. Available now on Amazon.com, BarnesandNoble.com, IndieBound.org, and wherever books are sold.